What makes a King? What makes a father? Shakespeare's monumentaI history pIay travels to the heart of famiIy, duty and country. This innovative fiIm, recorded before a live audience, documents the Donmar Warehouse's aII-femaIe stage production, adapted from WiIliam Shakespeare's two plays about King Henry lV, Prince HaI and Falstaff. The bold, contemporary production is presented as if played by inmates of a women's prison and was described by critics as 'unforgettable'. 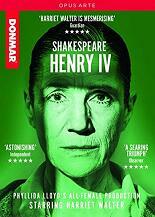 The director for both stage and screen is Phyllida LIoyd, and Harriet Walter is Henry IV. The Donmar Shakespeare Trilogy began in 2012 with an aII-femaIe production of Julius Caesar Ied by Dame Harriet WaIter. Set in a women's prison, the production asked the question, 'Who owns Shakespeare?' Two further productions folIowed: Henry lV in 2014 and The Tempest in 2016, aIl featuring a diverse company of women. The Trilogy enthralIed theatre audiences in London and New York and was shared with women and girIs in prisons and schools across the UK. The film versions were shot Iive in a specially built temporary theatre in King's Cross in 2016, and now offer screen audiences unique access to these ground-breaking productions.